From the kitchen of One Perfect Bite...My husband loves pistachio nuts, so when I saw this recipe I had to give it a try. It was developed by James Beard and I've never been disappointed with his recipes. I think I began this adventure with expectations that were too high. This is the type of bread that old timers called a race track. The race track is formed when a rectangle of dough, covered or smeared with a filling, is rolled into a cylinder that, when cut, will show spiral tracks of whatever was used as a filling. Now comes the hard part. I hate to contradict a master, but Beard thought this to be "one of the best breads of this kind I have ever had." I found this to be a very ordinary bread made expensive by its use of pistachio nuts. There is nothing wrong with it, but neither is there anything here that's worthy of commendation. If you like coffee breads, or are a fan of pistachios, you may like this bread, so I'm posting the recipe with reservations. While it is gorgeous to look at, it's too sweet to be a bread and not sweet enough to be a coffee cake. I'll let you judge for yourself. Here's the recipe. 1) Combine yeast, 1 tablespoon sugar and water in a large mixing bowl. Set aside to proof, about 5 minutes. Add milk, 4 tablespoons butter, salt and 1/2 cup granulated sugar to yeast mixture. Add flour, a cup at a time, beating well after each addition. I used 3-1/2 cups flour to mix and 1/2 cup to knead. 2) Turn dough onto a floured surface and knead until smooth and elastic, about 10 minutes. Form into a ball, place in a greased bowl. Cover with plastic wrap and set in a warm spot until doubled in bulk, about 1 hour. 3) Melt reserved 4 tablespoons butter. Set aside. Grease a cookie sheet or baking pan. Set aside. Punch dough down and turn onto a floured board. Let relax for about 10 minutes. Roll into a 18 x 12-inch rectangle. Brush surface of dough with butter. Sprinkle with reserved sugar and pistachio nuts. Using long end, roll dough as for a jelly roll, sealing each seam as you roll. Join ends of roll and seal together to form a ring. Transfer ring to baking sheet. Slice 2/3 of the way into ring at 3/4-inch intervals. Twist each slice to right so filling is facing upwards. Cover with plastic wrap and set in a warm spot to rise until doubled in size, about 45 minutes. Preheat oven to 375 degrees F. Brush surface of ring with beaten egg. Bake for 30 to 35 minutes, or until nicely brown. Cool on a wire rack. Yield: 12 servings. Ah, I saw the pistachios nuts - I love pistachios - and saw the beautiful ring like the coffee cake I made recently and thought "Yay another great coffee cake recipe". Thanks for your honest commentary and opinion. Maybe I'll put the two cake recipes together? It is really pretty, though. It's certainly pretty -- I've always admired anyone who can do those wonderful coffee rings. It IS beautiful. Maybe a glaze would help? I hate using expensive ingredients and getting just an average outcome. Baking bread, I am so looking forward to finally fulfilling some planned obligations and commitments this weekend that will then leave me free to bake with abandon! Bread is one of those things I love to bake this time of year. I appreciate you writing your opinions about the recipes you post too. I might give this bread a try. I have not knowingly tried any of James Beard's recipes and your commendation of him makes me think I should check one of his cook books out of the local library. I like pistachio so much. Bummer you didn't like it more. 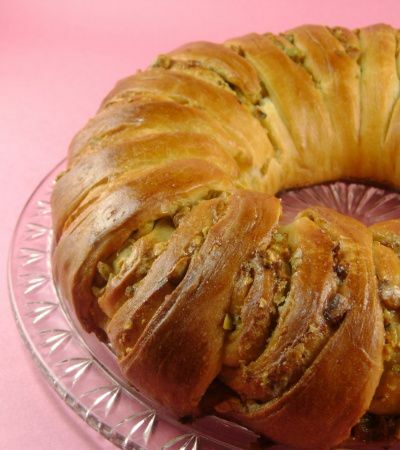 It is such a pretty bread--love the pistachios. It sounds like a perfect breakfast for the holidays. We love pistachios also. Oh pistachios how I love them!! This must be so very flavorful. They are so expensive to buy, I purchase them for special occasions. But this is a truly adequate reason, looks so wonderful. My hubby loves pistachios, too. The bread looks beautiful. Perhaps I'll give it a try. 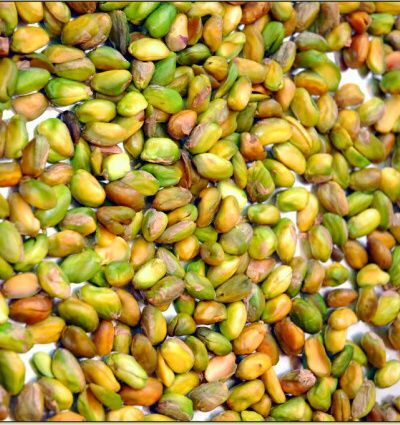 I am looking for a muffin recipe that contains pistachios...the Tampa Yacht Club serves them as their signature bread. They're fabulous! Unfortunately, I have not found anything like them. Have you? Love pistachios, but can't quite picture it in a bread! It looks fantastic though!!! wow che bella!! adoro i pistacchi!! chissà che buona! This would be hit with my husband too. Mary, if you tweaked this recipe and pehaps did a flaky puff pastry would it be good. Did it need more sugar too. I am NOT good at doctoring up a recipe so I need some pointers here. Definately want to make this a "One Perfect Bite!" Too bad... I love yummy pistachio baked goods. Maybe you could drizzle it with a lovely glaze and call it dessert. I have to head to the pantry for a pistachio fix! I never ate pistachios as a child, not because I didn't like them, but because I can't remember them ever being in the house. As an adult, I've discovered a fondness for them, and I'm excited to see this recipe. Thanks! Whoops, hit send too soon. Anyway, it does look good, and it's a shame it was a bit less than you expected. Maybe just a bit of tweaking is all it needs? It is a beautiful bread, Mary, and reminds me of a coffee cake my mother used to make. She called it a Swedish Tea Ring. It had a filling of dates and nuts. Mary this came out beautiful. i haven't tried any of jame Beard's recipes, a lot of bloogers really raves about him. I like that pistachios are used in this instead of the usual walnuts, pecans or almonds. Jane, I just did a google search and found pistachio muffin recipes. If you can describe the muffins I'll find the one that most closely resembles the one you are looking for and test it. 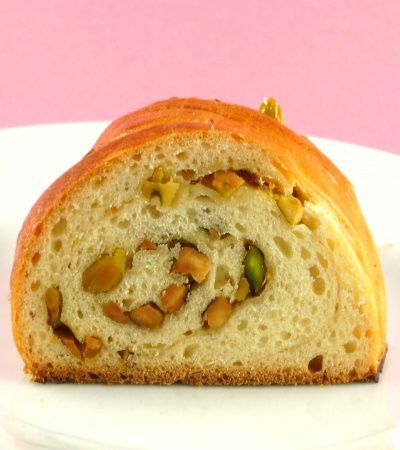 Joycee, I would use a brioche dough and more sugar and pistachios in the filling. Colleen and Butter Yum, a glaze would help but the real problem is in the dough. It's neither friend or foe. The ring needs a richer dough and the filling could use more pistachio flavor. Well... it does look pretty! My father loves pistachios. I think I will make this for him the next time he visits. Bookmarked! Lovely and Congrats on being listed in the top 25. I was thrilled to see both of us there! Maria, congratulations to you as well! I was really surprised. But it does look very pretty....maybe with a different filling it will work out better. I LOVE your honesty. Other food blogs only post their successes - never inferior recipes. I trust your judgement & won't spend my grocery budget on this cake. That turned out so beautiful! Wow, I love these nuts too, all nuts actually. Pistachios are so pretty. What a lovely coffee ring. WOW!!! what a BEAUTIFUL coffee ring. 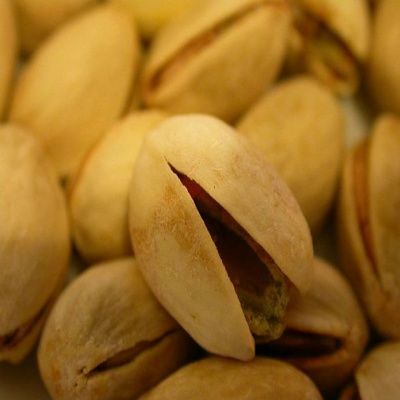 I love pistachio, they are one of my favorites along with pecans. I like a coffee cake that's not to sweet. Pistachios and hippos...I love ya'll! I love nuts, pistachios are a particular weakness of mine. The ring looks beautiful. I am sorry that the taste did not live up to it's promising beauty. I have only made one bread shaped like that and I stuffed it with savoury ingredients. I hope to make a tea-time one soon. Wow this looks wonderful! Thanks for your kind visit last week on my cornbread post -- I hope you'll try it sometime! As always, another fabulous recipe! Yum! I don't know where you find all these delicious recipes. This ring looks so good. Looks lovely. It's always a bit of a bummer when you spend time and money on a so-so recipe. Mary, this looks soooo good! Love pistachio & coffee flavour. Pistachio is quite expensive over here lol. Will try to get some anyway! Thanks. Your lucky husband! It looks wonderfully delicious. I actually just got an old copy of one of James Beards books with his signature in it. I actually got the book free! What a shame you didn't like this bread. It does look amazing. Hmm. Maybe with a almond paste coffee cake filling or maybe a chocolate almond paste filling. Pistachio looks so stunning peeking out from chocolate. Oooooooh, this looks so good!! YUM. :) I love pistachios and the coffee cake looks SO tender and delish! Hi, I'm a new blogger with a similar site and was wondering if you would be interested in a link exchange? You can check out my site at www.abouteggring.com. Feel free to email me at derekmlandis@gmail.com if you are interested. Thanks!